In this month’s iOS / iPad music app roundup, we take a look at a new diatonic chord sequencer (Changeling), a grid-based sequencer (Synergy Studio), a steampunk-inspired loop creation tool (Werkbench), and a new modular MIDI controller (Sonic Logic). One of the most exciting music composition applications that we’ve come across recently is Changeling Sequencer ($4.99) from developer TvanD. This app is billed as a “Flexible Diatonic Chord Sequencer” that supports 16 MIDI channels, iOS MIDI, and imported sounds. Where Changeling differs from most other sequencer applications is in its unique interface that allows you to input a series of monophonic notes and then turn those notes into different sorts of chords, depending on the scale and root note that you apply. In practice it’s a bit similar to Henrik Schwarz’s Max for Live effect “Schwarzonator,” except that Changeling can be used with multiple instruments at once in a self-contained application that runs on your iPad. Changeling is receiving lots of support from users including German techno producer Maxime Dangles, who created a Max for Live patch that allows you to control and record Changeling parameter changes from Ableton Live. With stable connectivity, consistent updates, and a dedicated user base, Changeling Sequencer looks like a great way to create complex chord progressions easily from your iPad. Werkbench ($4.99) is a clever loop-creation and performance application developed by Bolasol and released earlier this year with the description “steampunk beat box.” While the initial launch had slipped beneath our radar, it’s recently come to be one of our favorite inspiration tools on the iPad. With an interface that combines deceptively fun graphics, a sampler, two 16-step sequencers, effects, and a DJ-style mixer, Werkbench quickly generates loops from any source material you can find. While the app isn’t MIDI-capable (yet? ), the results of the self-contained audio loops are inspiring and they can be exported and shared in a variety of ways. 4PocketsAudio (creators of other iOS music apps including the Meteor multitrack recorder and the StompBox guitar effects rack) have recently announced a new sequencer application for the iPad called Synergy Studio that will be released on December 3, 2012. Synergy Studio bundles a grid-based sequencer allowing up to 64 notes per pattern and four instrument types (drums, synthesizer, sample and pad synth) together with a mixer and effects, creating an all-in-one loop creation tool. In addition to its onboard sounds, the application supports Bluetooth connectivity for project sharing and also supports iOS MIDI to connect to sequencing hardware or other apps on your iPad. 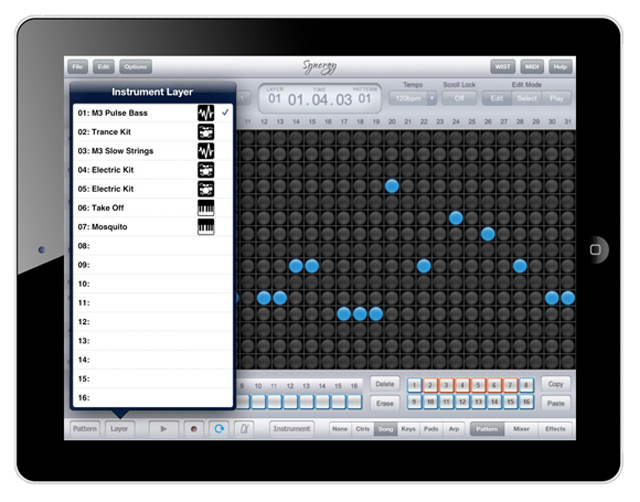 Sonic Logic is a new modular MIDI controller for the iPad that is slated for release in late November. While we don’t know very much about this app yet, we’re impressed to see a number of videos online that show the application controlling Logic, Reason, and Ableton Live with ease. In addition, the company’s Twitter feed promises Traktor support in the near future. Check the Sonic Logic Facebook page for more information and updates on this forthcoming MIDI controller app for the iPad.